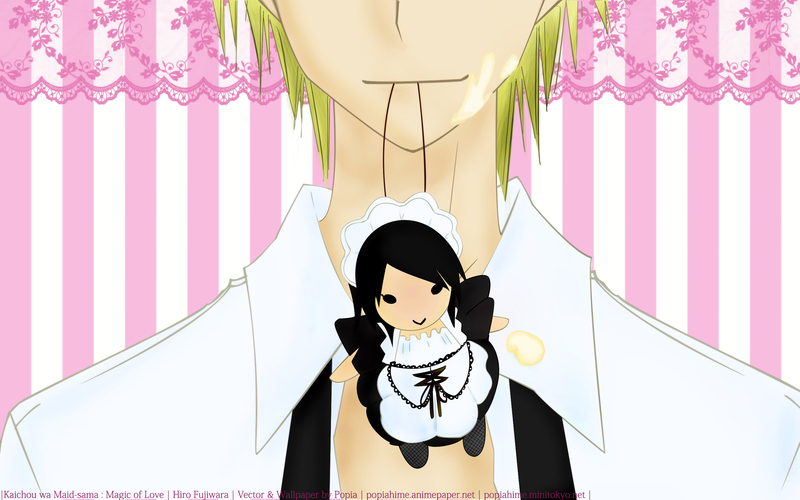 21st wallpaper, 1st for Maid-sama. Based on this by bouinbouin. The wallpaper was done in a spread of one week, during the exams week, to be precise. I'm lacking in entertainment and was Internet deprived, so I was stuck with Photoshop and much later, Sims 3. Magic of Love is chosen as the title because of the song sang by the Maid Latte characters - Magic of Love which is sooo nice. The background design was based on the Maid sama characters song album : here. - Reduced the sizeand added a bit more volume to her original dress. 3. And, made Usui half bare chested and creamed. Sorry for the ultimateness of simplicity and weirdness. I have gone haywire. p/s : Best viewed in widescreen since it was made in widscreen resolution. No other resolutions available. The 1600x1200 resolution is available here. LOL very cute wallpaper (^_^) Great job!